Spring has sprung! Flowers are blooming and birds are singing. I’m singing, too, but it’s not a pretty site, so we’ll keep that bit of news to ourselves, OK? You want to know what is a pretty site? My Chocolate Satin Pie with Chocolate Flowers. 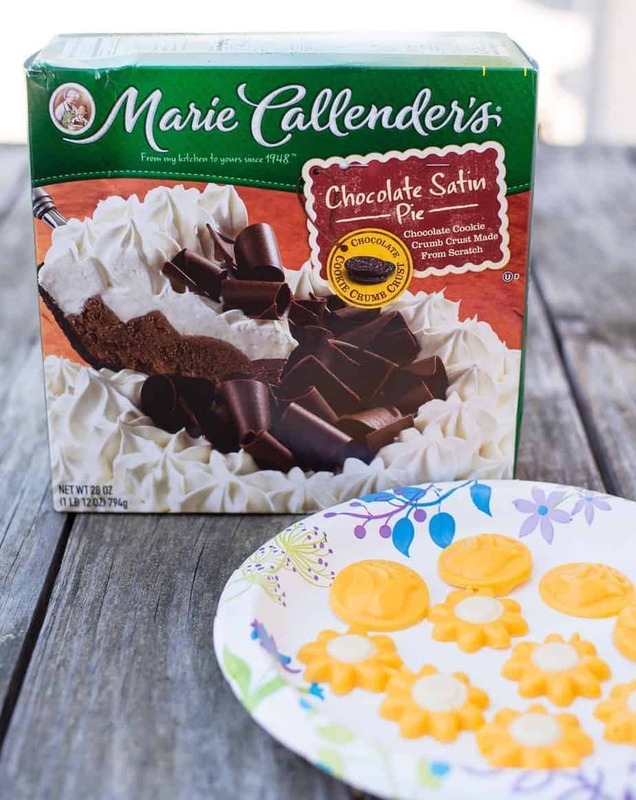 Actually, it’s Marie Callender’s Satin Pie, but what’s hers is mine since they use high-quality ingredients and signature special touches to create meals and desserts that smell, taste and look just like homemade. It’s the perfect dessert for my family to linger at the dinner table and enjoy each other’s company while we talk about our day. The best part? It’s a time saver AND it tastes and smells just like homemade. I also love the special touches like the hand-placed chocolate curls. I was out snapping photos of my spring crocuses a few days ago and a brilliant idea popped into my mind. 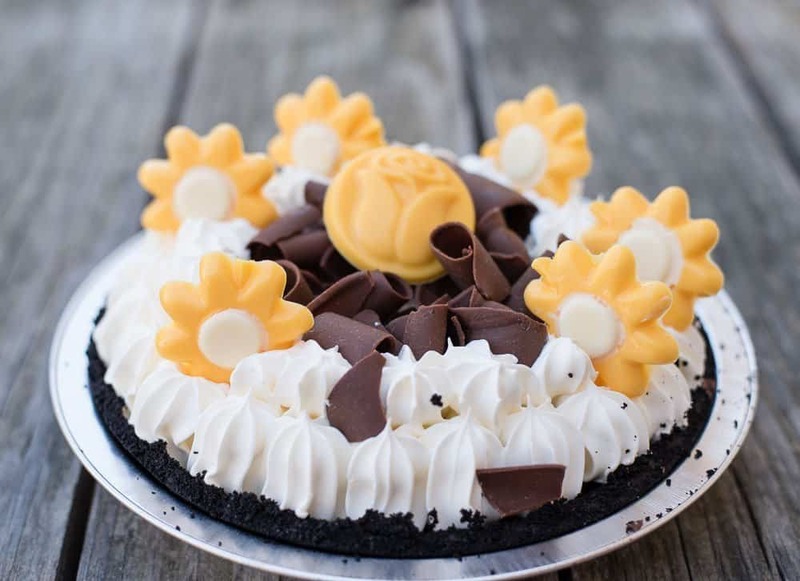 Since I already had a Marie Callender’s Chocolate Satin Pie stored in the freezer, I decided to add a special touch by garnishing the pie with chocolate flowers. 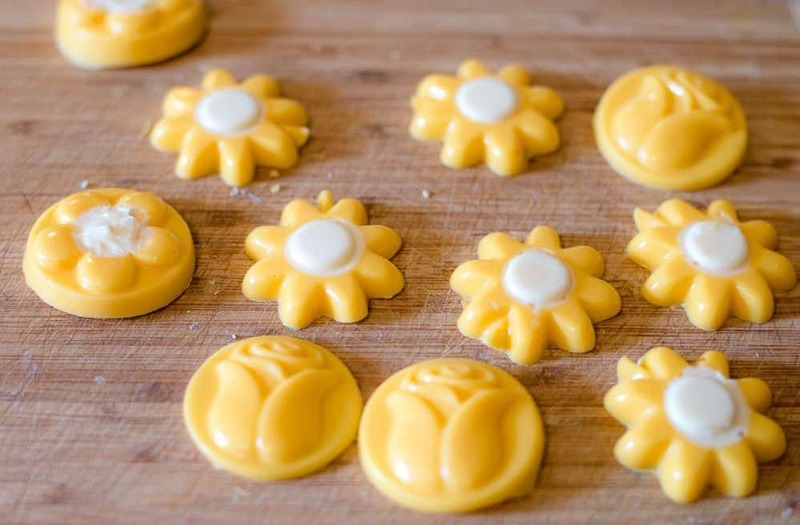 To make the chocolate flowers, I use a candy mold and colored candy melts. If you’re artistic, you can free-hand your chocolate flowers on a sheet of wax paper and allow to dry. I’m not that talented, so I use inexpensive molds. Melt the candy melts according to the directions on the packaging. Fill the molds and let harden in the fridge for about 15 minutes. Here’s a look at the chocolate flowers after popping them out of the molds. 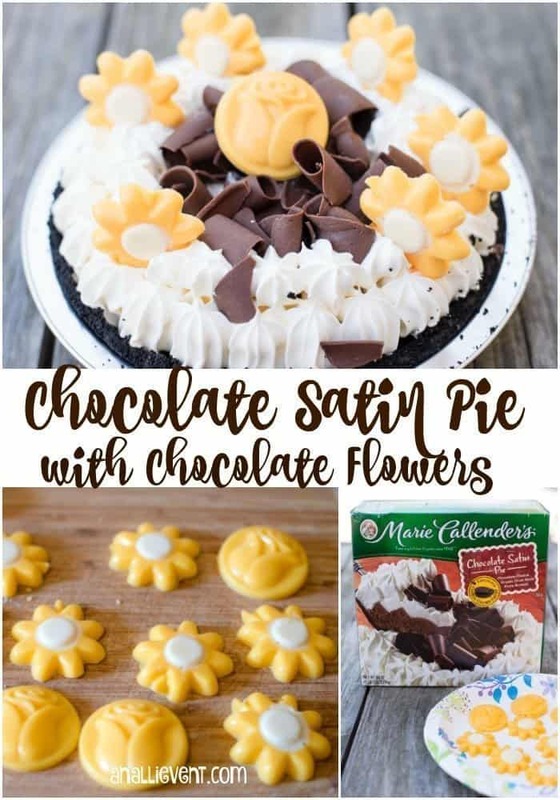 Top Marie Callender’s Chocolate Satin Pie with the flowers and serve to your family and friends. For more great ideas, visit Marie Callender’s Tip Page, and join me in following along on Facebook and Pinterest. That is a fun way to spruce up that pie! I haven’t had a Marie Callendar’s pie in forever, but now I want to go get one and eat the whole thing myself. We haven’t tried the satin pies. You sure made it look enticing!! Those flowers are so cute! Will have to try them one time! Oh wow! That is genius! 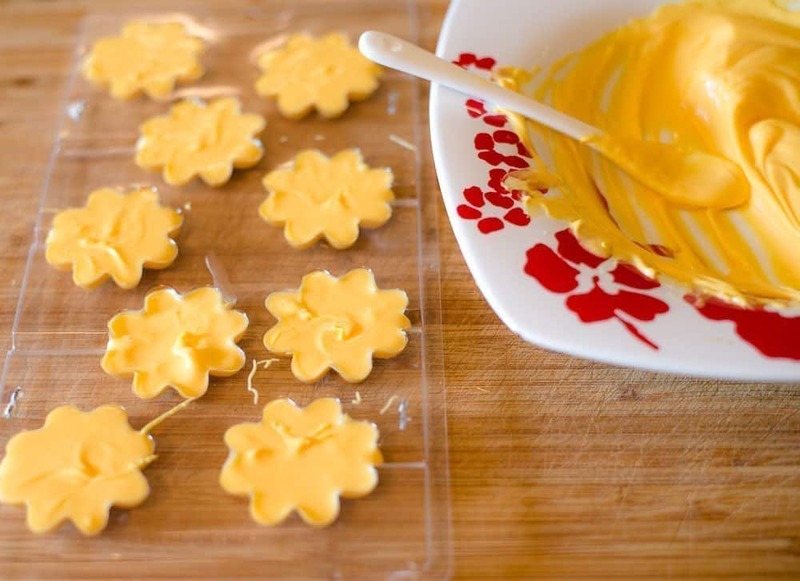 I love that you took a premaid pie and just made these quick, easy flowers to dress it up. That is SO pretty! I want to make something like this for a dessert that I need to make this weekend! It looks easy enough that even I could do it! I love the Marie Callender’s chocolate silk pie! I love how you made it your own. I never would have thought to dress up a frozen pie like this!! This looks very springy, I love it! that looks delicious, but almost too pretty to eat… love the detail, great work! I love these types of desserts. I was about to purchase one the other day while grocery shopping but obviously, did not. I like the idea of adding the chocolate flowers – they look so spring-y!! 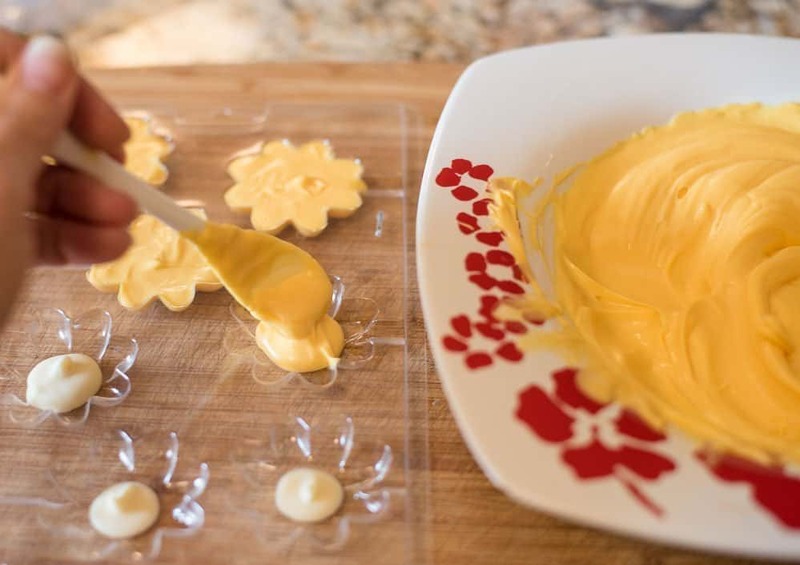 This is a fun way to make a packaged dessert your own and impress the people you are serving in the process. I could eat the chocolate flowers on their own and would have to make extra for that reason. Wow! The pie looks amazing! I did not know such lovely packaged desserts were sold at Marie Callender’s. mmm this looks so yummy! I love the idea of decorating premade cakes because I am not a very good baker! 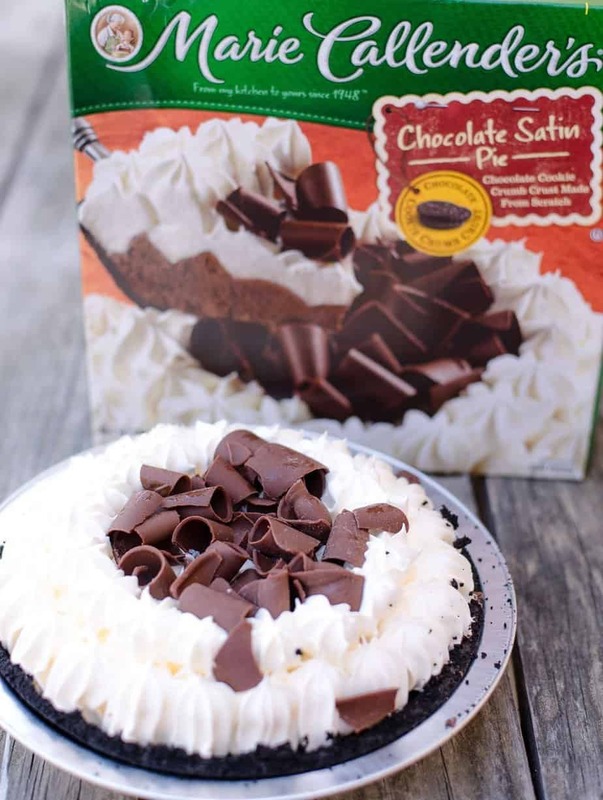 I LOVE Chocolate Satin Pie. Just add more chocolate to it? GENIUS! Oh my, this is such a cute way to fancy up a frozen pie! I would have never thought of this. What a lovely pie! I love adding personalized touches to store bought items. It really elevates everything. Wow, that is so pretty and such a fun way to make it!! I need to make this weekend! That looks really good. I am sure my hubby would like to have some of these on his birthday which is coming up very soon.